Home | 2016 | Schober? Schober left Breslau in mid June 1825 almost as abruptly as he had left Vienna two years before. He was back in Vienna by early August. His return was not that of the conquering hero. We might assume that he had found out the hard way in Breslau that the acting profession was really not for him. His audiences would certainly agree with him on that point. Whether that revelation ever penetrated Schober's colossal ego and self-obsession is doubtful, though, for his final performance was a special concert which was filled almost entirely with declamations of his own poetry and a specially written ode, 'Farewell to Breslau'. Every member of the audience at that event received a free printed copy of that masterpiece. We have attempted to disentangle Schober's personality complex: the detachment of the 'outsider' with the simultaneous inclusion of the 'one of them' and particularly his Geltungsbedürfnis, his need for recognition by others and the self-inflation that goes with that need. Schober, the stranger in the world of Breslau, could start from scratch and reconstruct his biography to those ends. And he did, for we know that after he had returned to his Viennese world someone from his Breslau world turned up wanting to see him. The visitor apologised for disturbing him, knowing as he did that Schober 'was always surrounded by great people' in Vienna. Sooner or later the compartments overlap. Detaching himself from his Breslau world at no psychological expense, he left behind some broken hearts and some bitter ones, too. His colleagues in the dressing rooms, we are told, often wondered what had become of him, because he had detached himself from them, too. His acting career in the Breslau world had caused the dissolution of his 'engagement' to Justina in the Vienna world. Unlike the earlier case of Marie von Spaun, it appears that the relationship with Justina really did end – she was made to see the light. Schober returned to Vienna, apparently without any plans. He became again 'one of them' and sank back into a life of torpor and langorous apathy. But things were not as they used to be. Some of the things that he could compartmentalise in his head now overlapped in real life. His treatment of Justina and the disaster of their now ended 'engagement' had outraged the Bruchmanns and all their friends. News of his philandering in Breslau during this engagement seems to have also reached Vienna. He has no concrete plans for his life; he says that he is intending to publish his poetry. In his tone and manner there was still the affection of the old days; I mean the tone of voice and the personal gestures, which you well know, too. He and I must have both felt an inner alienation, though. Quoted in Waidelich Torupson p. 145. 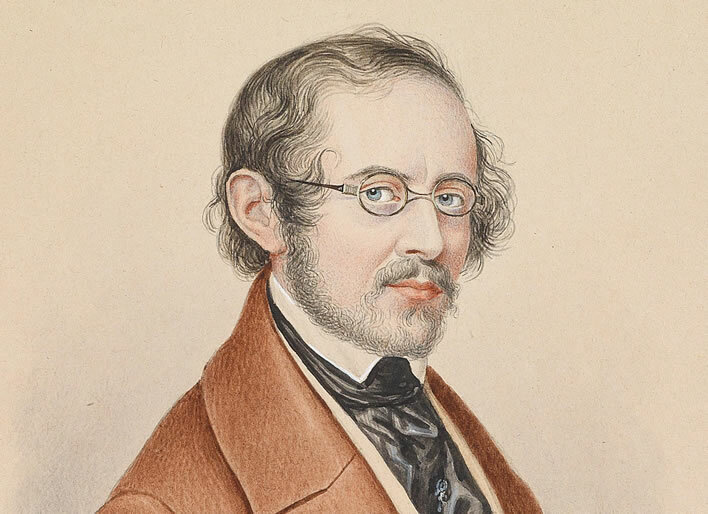 During Schober's absence others had joined the circle of friends, principally the writer and playwright Eduard von Bauernfeld (1802-1890). 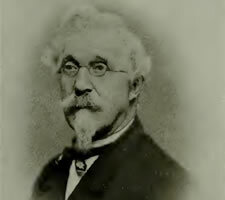 Unlike most of the others in the circle, Bauernfeld, an acute judge of human character, had not grown up with Schober and he came to him with a fresh and very analytical pair of eyes. He had heard of Schober's importance for the circle of friends, – 'Moritz reveres him like a god' – and when the specimen finally arrived its psyche was dissected expertly: Schober was 'rather human, but interesting' – a fine example of Bauernfeld's mastery of irony and satire, that the specimen is ziemlich menschlich 'rather human', not superhuman, as reputed. Speed readers of the German text might take menschlich in the meaning of the much commoner 'humane', but 'rather humane' makes no sense at all here. No, the Bauernfeld satirical rapier is at work. Schober is ahead of us all in spirit – and in speech indubitably so. But there are a number of artificialities about him and idleness threatens to suffocate his greatest powers. On other occasions Bauernfeld notes Schober's social power within the group of friends, particularly the way that Schober requires that others strain for his favour; those who do not strain sufficiently encounter difficulties with him. He is 'idle, as usual' or even 'partially mad'. Bauernfeld skewered Schober's character – and Schubert's and Schwind's as well – in a little play he read to the friends at a New Year's Eve party in Schober's house in 1825. It took the form of a satire using the traditional Commedia dell'arte pantomime characters: Harlequin, Pantalon, Pierrot and Columbine. The characters could be easily identified as members of the friends. Pantalon, unmistakeably Schober, is traditionally a character representing money, ego, self-regarding intelligence but who is also the gullible object of trickery and deceit. Schober was bow-legged and Pantalon is traditionally represented wearing loose trousers to cover his unattractive, skinny legs (hence 'pantaloons'). Bauernfeld's Pantalon/Schober is a lazy, money-grubbing do-nothing who spends most of his time in bed or in his dressing gown and holds the finest form of life to be a plant. He never visits others, he expects everyone to come to him. Harlequin, a wimp totally dominated by Pantalon/Schober, is a caricature of Moritz von Schwind. At one point Harlequin/Schwind says that Pantalon/Schober is the greatest person ever to appear on earth. Pierrot, a cheerful, easy-going, chain-smoking, semi-alcoholic simpleton, is a caricature of Schubert. Both Harlequin/Schwind and Pierrot/Schubert praise uncritically and excessively everything that Pantalon/Schober says. Bauernfeld's play is too long to discuss here, but it contains much pointed satire at Schober's expense, particularly in respect of his easy-going immorality with women. Schober appears to have taken the mockery in good part, but then, he had little choice: Bauernfeld was immune to his charisma and his social power, someone Schober could not dazzle. Moritz von Schwind, Pantalon entführt die Columbine 'Pantalon kidnaps Columbine', 1849. Pen and ink. 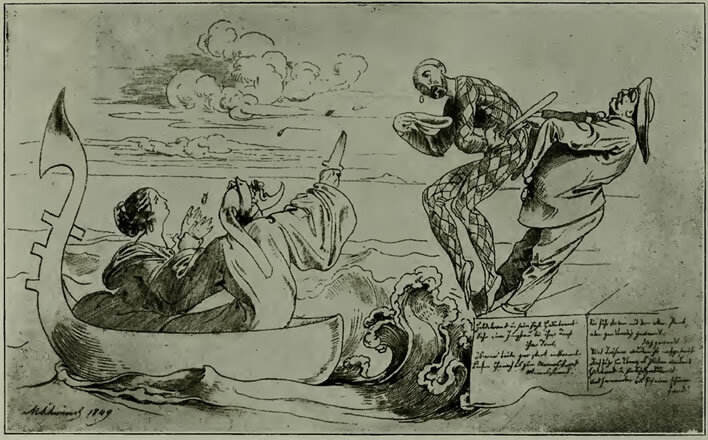 The Mephistophelean Pantalon (Schober) is making away with Columbine in a gondola(?). The solid Schubert (Pierrot) is holding Schwind (Harlequin) back. Image: Deutsch III, p. 269. A remarkable insight into the daily lives of the circle of friends during the two years following Schober's return to Vienna is given by the diaries kept by the two von Hartmann brothers, Fritz (1805-1850) and Franz (1808-1875), who were both studying Law at the University of Vienna between 1824 and 1818. If there is one thing that historians like nearly as much as a 'bluebottle' it is a compulsive diarist. We learn from these diaries of the frequent Schubertiaden, now mostly under the patronage of Joseph von Spaun, usually concluded by an intimate, tipsy nightcap in the local coffee-house or tavern. Schober usually appears among the participants in these evenings. Schober had also restarted his Lesegesellschaft but seemingly with a more select crowd. Typically he would declaim a text to the assembly; larger works would be divided up into parts over a series of meetings. Schober, the former fan of the suicidal Werther, seems also to have been a fan of the German writer Heinrich von Kleist (1777-1811), who exited this world by shooting a terminally ill woman he happened to know and then himself. He is a writer who divided opinion then and divides it now: I personally find much of his work unreadable, but I can imagine why Schober found his impulsive, convoluted prose amenable to his own personality. We have no reports of any discussions taking place on these texts. The texts themselves were harmless and certainly not at any literary or cultural cutting edge, not the sort of texts that would provoke discussion. These events really do seem to have just been a recitation opportunity for Schober. After their dose of Kleist or whoever, the group would retire to – where else? – the nearest coffee-house. Evenings without Schubertiaden or readings would often conclude with an assortment of the circle of friends turning up at some coffee-house or tavern and remaining until the early hours. We hear of gymnastic exercises in the street – Schubert sensibly avoided these – snowball fights and much noisy horseplay, to the annoyance of neighbours and the concierges who were woken up to let tipsy and happy young men back into their apartments. As already noted, some months of lethargy followed Schober's return to Vienna in the autumn of 1825. This was the Schober that Bauernfeld satirised in his pantomime at the end of that year: when not in bed smoking a pipe then lounging around in a dressing-gown, smoking a pipe. In May 1826, however, there was a sudden change that startled the friends. Schober bought into the Lithographisches Institut, the lithographic printers in Vienna, becoming its Managing Director. Schober has become a lithographer, i.e. he is a shareholder in the Lithographic Institute here and thus is now in his element, that is, he messes about all day, goes to the draughtsmen and tells them how to do their jobs etc. I think I characterised him accurately when I cast him as Pantalon in that pantomime. Quoted in Waidelich Torupson p. 155. A partner noted that Schober was completely unsuitable for the task, he was 'slow, indecisive and timid'. He was right. Schober's participation ended in the deepest desperation. The writing was on the wall by November 1828. Bauernfeld noted on 22 November that Schober was 'close to bankruptcy'. 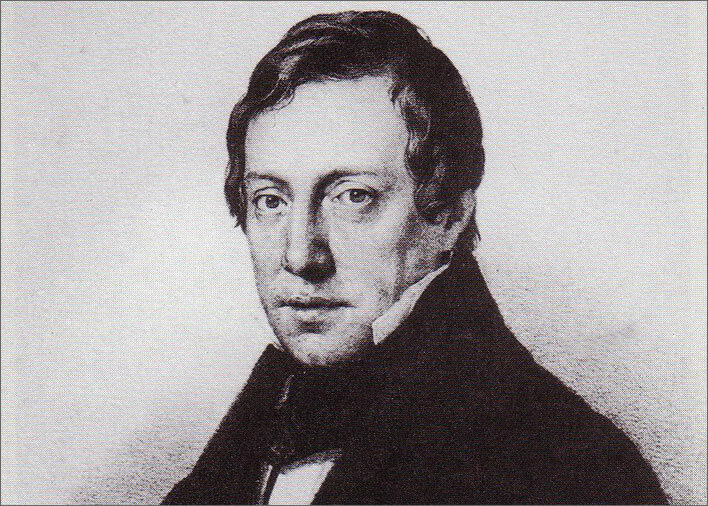 Schober had invested a large part of his wealth in the venture and lost a large part of that when he sold his interest at the beginning of 1829. We can imagine his state of mind: the despair of the egomaniac who finally becomes aware that for all his brilliance he does not have the capacity to make an income for himself. Schubert had rooms with Schober from February 1827 to August or September 1828, then moved in with his brother Ferdinand. The typhus that would kill him struck at the beginning of November. He took to his bed around 11 November and was looked after by Ferdinand and his family, particularly the 12-year-old daughter Therese and Franz Schubert's 13-year-old step-sister Josefa. We acknowledge their great but unsung contribution to Schubert's life in these times of messy need. Bauernfeld and Spaun visited him. His old friend Johann Mayrhofer, whose obsessive fear of disease was part of a more general depressive psychosis that would drive him to suicide in 1836, would certainly never have visited him. The last letter of Schubert's that we know of, written on 12 November, seven days before he died, is addressed to Schober. I'm ill. I haven't eaten or drunk anything for 11 days now and stagger weak and wobbling from chair to bed and back. [Dr.] Rinna is treating me. If I try to eat anything I just bring it up again straight after. Be so good as to help me with some reading in this desperate situation. From [James Fenimore] Cooper [1789-1851] I have read: 'The Last of the Mohicans' [e/d:1826], 'The Spy' [e:1821, d:1824], 'The Pilot' [e/d:1824], 'The Pioneers' [e:1823, d:1824]. Should you have anything else from him I plead with you to leave something with Franz von Bogner in the [Bognor's] coffee-house. My brother [Ferdinand], conscientiousness incarnate, will bring them conscientiously to me. Or something else. The letter displays Schubert's dry humour – remarkable under the circumstances – but attracts the interest of our team of armchair psychologists. This letter was more than just an appeal for books. The books were just an excuse. This is the sort of letter that the socially weak write to the socially dominant, whose attention they require. As we have noted: socially weak people visited Schober, Schober did not go to them. We have all the required signals of deference: there is no attempt to ask directly for a visit by Schober, just an oblique request for books to be sent via a third party; even the precision of the demand is nullified right at the end by the abject 'or something else'. Schubert wanted a visit. His first paragraph described his misery, but never attempted to state the obvious conclusion. How a visit from his soulmate would have cheered him up! As far as we know, Schober never came – never followed up on that unspoken plea. We don't know either whether Schubert received the books or whether, by that time, he would have been capable of reading them. We do know that during that November Schober was writhing in the last, desperate struggles of his business venture and was staring into the abyss of financial ruin. Perhaps Schober viewed Schubert's illness as optimistically as the patient seemed to view it, who knows? On 19 November 1828 that optimism proved to be misplaced. The days of wine and roses in the coffee-houses of Vienna… well, they are not long.